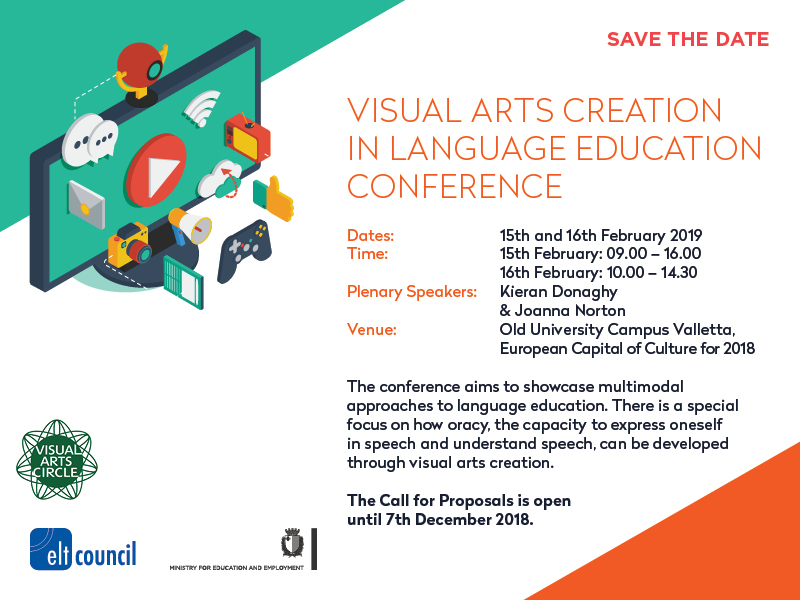 We are delighted to announce that the Call for Proposal for The Visual Arts Creation in Language Education (VACLE) Conference in Valletta, Malta on 15th and 16th February 2019 is now open. The VACLE Conference which is being co-organised by the ELT Council and the Visual Arts Circle is an innovative event that explores the possibilities that creation of the visual arts (drawing, painting, design, crafts, photography, film-making, video-making, computer art and gaming) offers to both language teachers and language learners. The VACLE Conference seeks to bring together leading experts and practitioners in visual arts creation in language learning that share their experiences, insights and know-how, and provide participants with a unique opportunity to enhance their competence in teaching visual arts creation in the language classroom. The conference aims to showcase multimodal approaches to language education. There is a special focus on how oracy, the capacity to express oneself in speech and understand speech, can be developed through visual arts creation. The Call for Proposals is open until 7th December.